It's been a long & incredible journey for Lewis Bannerman - but his documentary is finally here. Please share across all social media platforms! Last night was one very special evening for Team Future Choices, especially with it being in our 10th Anniversary Year. Receiving a Spirit of the Community Award for all the voluntary work we do. It is the biggest most privileged feeling to be leading such an amazing dedicated team. Emotional beyond words. Ladies & Gents, thanks to our Saltire Awards Achiever, Lewis Bannerman, Future Choices is now on Snapchat, please add us if you have an account & keep up-to-date with what We're upto. Lewis Bannerman (16) for contribution to the theme of Education, through his upcoming Documentary. Ryan Bannerman (12) for contribution to the theme of community Participation, following his food & drink token appeal to support the homeless community. This is absolutely incredible recognition, 3 cheers for both Bannerman boys. Hey everyone, here's our Saltire Award Achiever Lewis Bannerman letting you know that we've teamed up with Spree Aberdeen to sell these amazing spree books which has so many fabulous offers. Each book costs £20 & £5 from each book goes to Future Choices. Please contact us directly to get yours. Absolutely delighted to learn that Future Choices has been sponsored by KPG, simply humbled. A Massive thanks to Laws Tyres for donating several vouchers to assist our young Saltire Award Achiever raise more funds. Thank you so much. A HUGE HUGE thank you to The Balmoral Group for their very generous donation of £500, they recognise our voluntary work within the community and wanted to support Team Future Choices. We all know how challenging it can be to Fundraise in general, so I'm very grateful to Mel for Supporting Lewis Bannerman's first ever fundraising effort, Lewis has 20 Vouchers for £10 each - so his goal is to raise £200, what an achievement, the Evening Express are also looking to do a feature soon on Lewis's voluntary work, all this during his summer holidays. Truly inspiring!!! 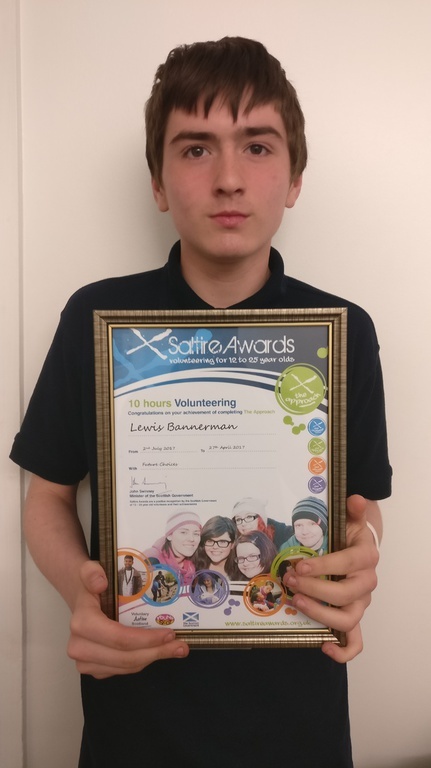 Another successful achievement for our Saltire Award achiever Lewis Bannerman, who today was recognised by ACVO's Mike Melvin for reaching his 25 hours goal, Lewis is now on course to reach 50 hours soon, which is really great & so inspiring to others. We're delighted to announce that our first Bonus Ball Fundraiser has been a success, raising a total of £295, Our lucky winner Muriel Benzies, who's number was number 2, (Lotto Draw from Saturday 10th June 2017) will be enjoying a lovely overnight stay with breakfast at the Marcliffe. We want to say a huge thank you to everyone that took part, you may not have been lucky to win but you are supporting a truly much needed cause. Today was a special day at our session, we stopped for a bit to recognise the valuable work carried out by our Volunteer team. It is so true that without the dedication & sheer commitment, we wouldn't be able to run things. Huge thanks to Mike Melvin from ACVO and Volunteer Aberdeen, your support is always appreciated. Huge thanks to Laurence Caie Hosie for taking our photos, very much appreciated. We did request the Lord Provost to attend but the office of the Provost unfortunately failed to reply. 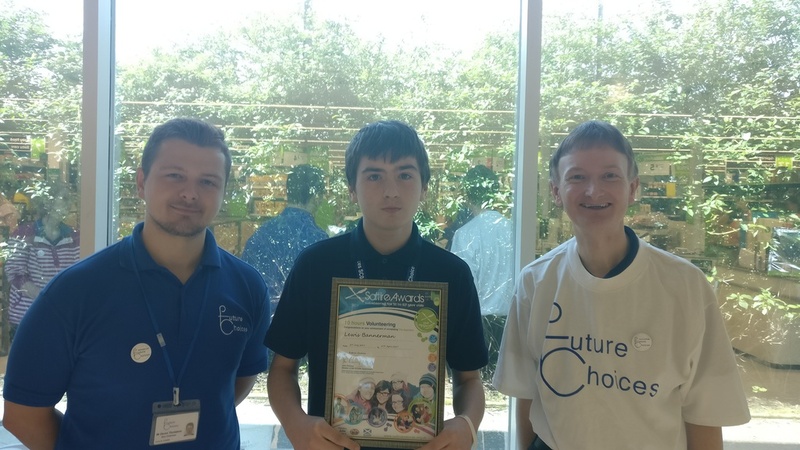 Our Saltire award achiever, Lewis Bannerman has successfully completed his first 10 hours of voluntary work with Future Choices & was presented with his certificate by Charity Vice Chairman Devon Thompson & ACVO's Mike Melvin. Lewis is now working towards his 25 hours, & we wish him all the very best of luck. Team Future Choices took to the tills at Asda, Garthdee for a fun day of Bag Packing. Raising a total of £320. A huge thanks to Asda & it's customers and of course all our Volunteers. Various Volunteers & Management committee took part in a first aid course today to keep upto date with procedures. Shop online, support Future Choices, at no extra cost to you, check out the link to see how it works. Team Future Choices launched it's latest Fundraiser, For all the details please check out the section on the right hand side under "Bonus Ball"
Delighted to welcome Hollie from Asda Garthdee today, where our Treasurer, Helen Devos accepted a cheque for £200, this was from the public donating there green tokens to Future Choices. We cannot thank you all enough for supporting us. Super day today with various activities going on. Making his first volunteering debut at the gathering was our Saltire awards achiever Lewis Bannerman, he's already reached his 10 hours and is now next on course to reach his 25 hours, therefore very very proud to announce that Lewis will be leading Future Choices down union st on the Celebrate Aberdeen Parade in August. Lewis is an absolute shining example of what can be achieved by our young people when given the opportunity & support. Thank you Lord Provost, from Future Choices. Treasurer, Helen Devos, Secretary Lesley Anne Bremner & Vice Secretary Moira Henderson took to the Shmu FM (99.8fm) airwaves to chat about everything the charity is up to. We thought this story was absolutely worth sharing and it's so inspiring, a member of Future Choices, who had a bad stroke which affected his arm, still manages to create amazing art pieces with his other arm, with the incredible support of our resident artist. The photo on the left is his work copying the image pictured on the right. Team Future Choices getting into the Easter Spirit. The Chairman & Vice Chairman challenged City Councillors to experience getting around the city in a wheelchair, and boy did they realise how difficult it was. I want to thank all the participants for taking on the challenge, Marie Boulton, Stephen Flynn, Steve Delaney, Len Ironside & Douglas Lumsden. David & Devon want to say a huge massive thanks to the helpers, cause without them, we couldn't have done today, Gayle Kaufmann, Jackalynn Luisa Walker, Tracy Gaitens, Luke McLeod, Ruth Anna, Ean Watt. I want to say also a big thanks to Shopmobility Aberdeen for lending us the Wheelchairs. This is the absolutely amazing achievements that volunteering your time to help the local community can bring. Lewis Bannerman being recognised at his School for taking the lead role (in our new charity video) on promoting young people to volunteer. A true shining example & Inspiration to us all. On Saturday 1st October 2016 Future Choices, a local voluntary led charity that supports disabled adults, held it's 8th Anniversary birthday at the Copthorne Hotel with the help of Aberdeen Fashion Week director Lydia Kemunto. The event was full of live entertainment and raised £1,500. The event was enjoyed by all that attended. This is a short video we filmed and edited highlighting the various young dancers, singers, models and dresses that were showcased that evening. We hope to work with this charity again in the future. We hope you enjoy!!!! Team Future Choices took to the air waves live at Shmu FM (99.8FM) to discuss the topic of Science. It was such a great team building day, massive thanks to Paul O Connor MBE for giving Future Choices the opportunity to take part. Want to thank the staff at Shmu as they were fantastic the whole way through. The team, made up of David Forbes,Devon Thompson ,Jacqui MacLennan, Gabriel Tracy, Gordon Innes & Bob Duncan, we hope those that managed to tune in enjoyed the show as much as we did putting it together. Future Choices Shmu FM Show. Join Team Future Choices as we take to the airwaves - Live! With sincere thanks going to Inchgarth Community Center Chairman, Paul O'Connor MBE for this kind donation.This is an exciting and unique team building exercise, which we hope you will all enjoy. Tune is to Shmu FM (99.8FM) from 4-5pm on Wednesday 8th March. Vice Secretary, Helen Devos accepting £170 from Carol at Lawrence Milne in Berryden. Lawrence Milne chose to fundraise via the 5p bag charge, for Future Choices following a public vote a couple of years ago, where thanks to public votes, we secured our place. Lawrence Milne have today confirmed they will continue to fundraise for Future Choices using this method. Such a joy to have to local business supporting a local charity. On behalf of everyone at Future Choices, a huge thank you to the public and Lawrence Milne. Vice Chairman, Devon Thompson in urgent appeal for volunteers. This will be held on Tuesday 21st March at Inchgarth Community Centre in Garthdee from 11am until 1.30pm, where issues relating to the charity & formalities will be discussed. Refreshments can be purchased from the Cafe. Tokens will be printed in the Press & Journal paper from Monday, 13th June until Saturday, August 27th. I have nominated David Forbes as the Local Hero to represent Aberdeen South and North Kincardine at the opening of The Scottish Parliament on July 2nd. David is the volunteer chairman of Future Choices. I have chosen him because of his dedication to volunteering and care, giving up much of his time to Future Choices over the past 8 years. The charity provides a social setting for people with physical disabilities and supports inclusion by providing transport to a supportive environment, meeting every Tuesday in Inchgarth Community Centre. By happy coincidence, my nomination of David has come this week during Carers Week, an annual campaign to raise awareness of challenges carers face, and to recognise the contribution they make to families and communities throughout the country. Charity A.G.M. done and delighted to announce that David Forbes was Re Elected as Chairperson, The Management Comittee are focused and driven to continue the dedicated Voluntary work. Also a great bonus to have a fresh face being elected onto the Management team, welcome Devon Thompson. I am writing to inform you that Future Choices was nominated for The Queen's Award for Voluntary Service 2016. This award was created by The Queen in 2002 to mark the occasion of her Golden Jubilee, recognising excellence in voluntary activities carried out by groups in the community. The nomination of Future Choices for The Queen’s Award for Voluntary Service 2016 represents a tremendous achievement for your organisation. Everyone involved, and particularly your volunteers, should feel immensely proud of the recognition that a nomination for this Award represents. The work your group does for the community was very much admired by the Independent Assessment Committee. Unfortunately, given the large number of nominations and the very high standards throughout, I am sorry to say that in the end 2016 was not among those selected to receive the Award this year. However, on behalf of The Queen’s Award for Voluntary Service Team, please convey to your volunteers and other staff, our warm appreciation of the excellent work they do and of the enormous benefit it represents to the local community. The Queen’s Award for Voluntary Service Team are pleased to recognise the value of your work and the significance of your nomination for this Award. The Management Committee had a really spectacular day at Aboyne Academy watching the Pupils' Presentations on their chosen Charity. In the first time in our history, we have been donated a Legacy! We are simply over joyed and humbled with the amount we have been given - £6,643.36. We would like to take this opportunity to pay a special tribute to the late William Ironside Fraser. Your money sir will be going to benefit the disabled community as per your wishes. Ladies & Gents, Courtesy of our Dear friend Devon Thompson, here we have our brand new video. *** PUBLIC REQUEST *** This is an urgent appeal to help us spread our message. We rely 100% on getting our vulnerable members to and from home via our 2 buses - so without drivers, we'll ground to a hault and this simply cannot be made to happen. Look who has won an award! Today, team Future Choices took a day off it's regular routine and was there to support it's Treasurer Gladys Annand at the ACVO awards ceremony. Gladys was award the ACVO award for being an 'Active Citizen. Congratulations.....! You may have gathered there was NO group gathering on Tuesday 29 March - SACK the web wifie! We had 2 special guests from RBS (St Nicholas Branch), coming to see the valuable voluntary work we do. RBS have pledged to support us as much as they can in the near future. Following last years amazing Social media competition when the public got the chance to nominate Future Choices. This meant Decorating Firm Lawrence Milne would donate 5p from every carrier bag charge. They raised a total of £200. Thank you all so much. Gladys and Sandra with one of the rag dolls. A massive sincere thanks to Charity member and dear friend Sandra McCabe for raising £250 by hand-making Rag Dolls. It is fundraising efforts like this that helps us continue our valuable voluntary work. HOPE TO RESUME AGAIN ON TUESDAY 23 FEBRUARY. Some of the Management Committee joined the pupils of Kaimhill Primary School today to present them with a donation of £100 to go towards their fundraiing efforts for a future school trip. They need as many donations as possible so Future Choices were delighted to be able to assist them. Lesley has secured two new volunteers to take on the challenge of the website and look forward to having it updated on a regular basis. Do let us know what is missing or what's just right. We are absolutely thrilled and delighted to announce that we recieved a cheque for a total amount of £7,092.03 from Sainsburys Garthdee following our yearly partnership. We would like to thank all the staff and management of Sainsburys Garthdee who worked tirelessly with us and also our friends and volunteers who helped make this possible. We are extremely grateful and overwhelmed by your kind donations and look forward to your continuous support to the charity. From today we have a new postal address for any mail you may wish to share with us. We are absoutely thrilled to be celebrating our 5th birthday of Friday 28 November. For the last 6 years, we have been tirelessly working to help those most in need of social inclusion. To help celebrate this anniversary, we're having a special gathering at our usual location, Inchgarth Community Centre on Tuesday 25th November from 11am-2pm. We hope to see you there! Following a social media nomination process, bosses at the decorating firm wanted the new 5p bag charge to go to a local charity, so members of the public were encouraged to nominate their charity they wanted the revenue to go to - overwhelmingly, the public chose Future Choices. More updates in due course. Will be used for general donations and sponsorships through Challenge Yourself. Trying to make things are easy and accessible as possible! Individuals from the charity were presented with "GOLD" ACVO Certificates by Aberdeen's Lord Provost. George Adam, with the assistance of Mike Melvin from ACVO. This award recognises the contributions made by members of the charity over 55 years old. We have made it much easier to contact us - and it's free! Our new telephone number is just below and feel free to contact it as much as you'd like. We have definitely went from strength to strength in this last year and this is just another great avenue. Wonderful news for us and the community! The superstore Sainsburys has chosen us as their Local Charity of the Year 2014/15. Sainsburys based in the Garthdee area of Aberdeen will be promoting our services for the next year and we couldn't be happier. Let us know if you see or hear anything about this in the store - hopefully you will soon! All across the UK in June 2014, there was an awareness week to celebrate the countries Volunteers. The 3rd Sector relies heavily on people giving up their free time to contribute towards helping the communities. Future Choices recognised some of their Volunteers and gave them praise, all of whom have busy lives but find time to help those who need it most. Well Done to you all! Our fantastic items on our Merchandise page is now available to purchase. We are very pleased with the quality of these items and we hope you will be too. All the proceeds raised from the sale of the items go towards helping our members. Our new website has finally launched. Now it is much easier to get in touch with us, donate to our cause, enquire about volunteering, take part in our challenge yourself campaign and even purchase a small support item :-) Please let us know what you think of the new site. Thanks! As our AGM is approaching, we would like to welcome onboard our new committee members - Sean Gordon & Margaret Kennedy. We wish them all the best and have complete faith in their abilities to help take the charity to the next level. We are truly honoured to have such a huge organisation choose us for a charity endevour. We really do appreciate their very generous donation of a new bus to help us better transport our members. Amazing news for us really. We cannot thank you enough Apache.